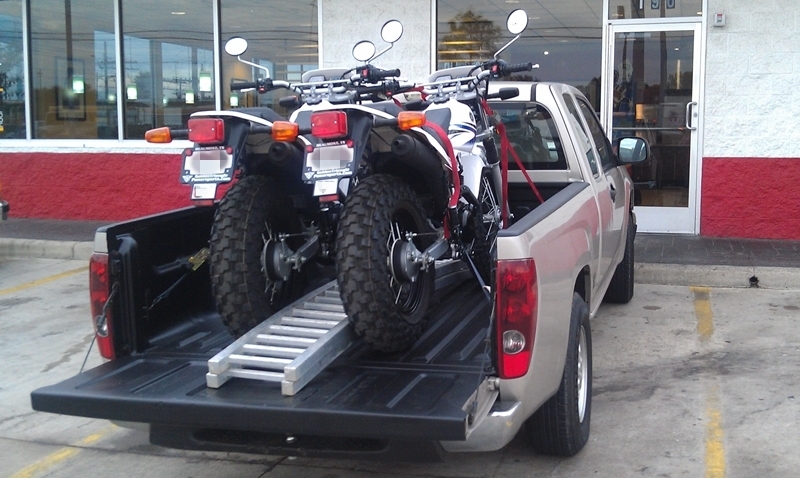 We brought home some new toys last night – dual sport Yamaha TW200‘s. Don can barely contain his glee. He’s been riding things like this since he was about 5. Me, not so much. My dad bought me a 3-wheeler ATV when I was around 5 but I wasn’t sure about it. One of my fearless friends at my birthday party jumped on for a ride. I watched and pondered whether I was brave enough and she promptly tipped herself off going over uneven ground. That was all the confirmation I needed that it wasn’t for me. LOL I think it sort of became my sister’s after that. I may have ridden it some, probably with her, but I really can’t remember. I’ve been a passenger on many a motorcycle, both with my dad when I was young, and with Don. And we’ve had our own 4-wheel ATV which I enjoyed immensely. But I never had to learn gears or shifting or any of that. This is going to be a new experience for me. Luckily these bikes are perfect for the beginner rider. To some they are not much more than a glorified scooter. Not a lot of power, lightweight, and small with fat tires. 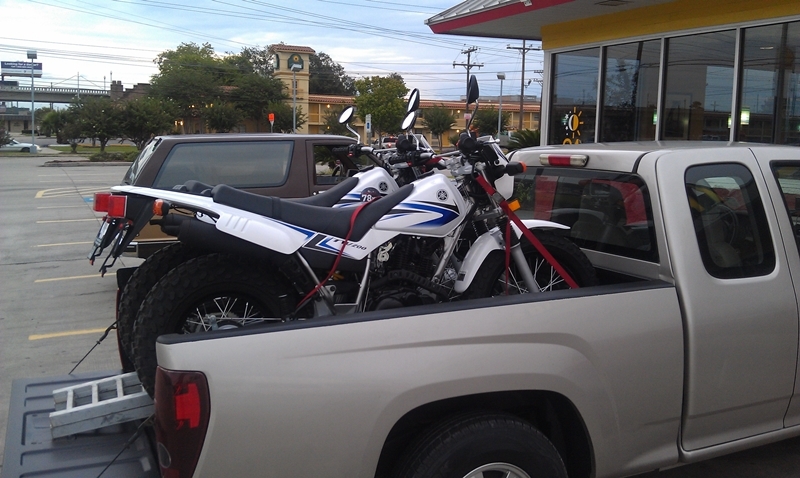 We can ride them both on and off-road but it will be mostly off-road for me until I get the hang of things and take a motorcycle safety course for my on-road endorsement. I don’t see myself doing a lot of on-road riding but it may come in handy some day so I might as well learn and have the ability. Don hopes to do some commuting to work with his bike. They get about 78 mpg so they can make a great commuter vehicle if you don’t have far to go or much gear to pack. I had my first crash course in riding last night. We got home from the dealership after dark so we just stayed in our apartment complex and we puttered around it twice, me in first gear only. I only killed the engine once and throttled too much by accident another time. No harm, I just went a little faster than I was prepared for. LOL Being around all the parked cars, and some neighbors pulling in or out of the complex was a little nerve-wracking. My hands were sore from death gripping the handles when we were done. I will need much more practice in unpopulated places like the woods or the beach as I learn the finer points of shifting and maneuvering. At least I didn’t fall or hit anything last night!